Of all of the potentially harmful things we encounter in our society, radiation is one of the most feared. 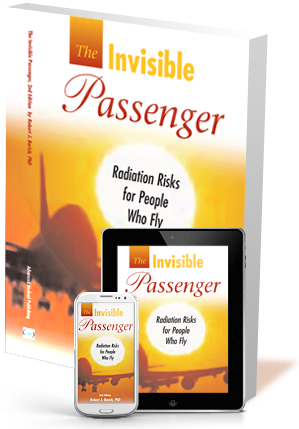 The Invisible Passenger: Radiation Risks For People Who Fly explains how if you fly often, especially if you’re one of the aircrew or a frequent flyer, you receive radiation doses that are higher than those received by most other people. This book lays out the facts of flying radiation risks and helps to put the risks of in-flight radiation exposure into their proper perspective when weighed against other risks in your occupation and in life in our technical society. In 1994 the FAA classified all flight crew as radiation workers. Since May 2000, European law required that all EU air carriers provide radiation training and dose assessment for their air crew. Pregnant women who fly regularly, either as crewmembers or passengers, might exceed recommended radiation exposure levels for pregnancy. Certain "storms on the sun" can significantly raise in-flight radiation levels beyond the norm for brief periods. The FAA wants aircrew to understand the heath implications of their occupational exposure to ionizing radiation and their scientists have published extensively on the subject. 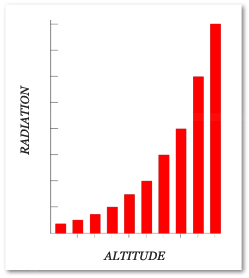 For pilots and flight crewmembers working typical schedules, Flying Radiation Risk is at an all time high. The FAA has determined that there are three major health risks related to flying radiation. Flying radiation risk is particularly high for frequent flyers. The Invisible Passenger: Radiation Risks for People Who Fly, defines in-flight radiation and how it impacts frequent flyers. Specificaly the three major health risks related to flying radiation. The FAA has determined that pregnant women and their unborn children are at a higher risk of birth defect and cancer as a result of prolonged exposure to flying radiation. At the flight altitudes of long-distance commercial airline routes, cosmic radiation levels from our own sun and other stars in the galaxy are normally more than 100 times higher than at ground level. Aircrew and frequent flyers often receive annual exposures that exceeds the dose limits allowed by law for members of the public whose radiation exposure would come from proximity to ground-based medical or industrial facilities. Copyright © . Advanced Medical Publishing. All Rights Reserved.